1. New Age Roots (The Movement) – Md. who has put over 30 years of his musical experience into this production. During that time Mackadub has become an accomplished musician playing bass guitar, drums, rhythm guitar and keyboards. Mad Professor, Jah Shaka, Dr Alimantado, Aisha and Macka B to mention a few. 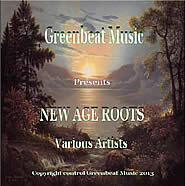 NEW AGE ROOTS is the roots music for everyone in this new age that we are living in. With all the new technology that is around now it only stands to enhance and develop the precision of the vibrations and sounds that you hear in the mix. The album consists of various artists from all over the world singing songs of experiences and reality to question and enlighten our thoughts in these times. This album is a must for those who like to engage with the positive vibrations that occupy our universe. To order any of these cds simply contact greenbeatmusic@hotmail.com. More samples to come ! All these tracks were recorded and produced at the Lionheart studio by Mackadub during the early 1980's. Featuring some well known artists, some in the early stage of their careers and some not so well known. Using the 'tape to tape' method you had to be very precise, recording one instrument at a time, at the right level in the mix in one take. So sometimes you'd let a little drop note go in order to keep the original vibes.